Please notice this article contains parts of information (still useful) and may not reflect all functionalities of this module. For download, source code and so on you should refer to the dedicated PSWinDocumentation module page. After reading this one… of course! It contains useful information, examples and know-how. Without it… you may be lost! What did Mateusz bring to PSWinDocumentation ? This covers basics of AWS. If you feel like it's missing some data, or that it would be useful for others to have more documentation on AWS front feel free to shout! If you want to run AWS documentation… following starting script will do it for you. Keep in mind this and other examples on how to use PSWinDocumentation module are located on GitHub in Examples. Keep in mind that what you see in sources may be higher than published version. Text            = "This document provides starting overview of AWS..."
Text            = "Basic information about EC2 servers such as ID, name, environment, instance type and IP." Text            = "Basic information about RDS databases such as name, class, mutliAZ, engine version." Text            = "Basic information about ELB and ALB such as name, DNS name, targets, scheme." Text            = "Basic information about subnets such as: id, name, CIDR, free IP and VPC." Text            = "Basic information about reserved elastic IPs such as name, IP, network interface." Text            = "Basic information about IAM users such as groups and MFA details." What are you saying? SQL? While I don't think it will be very popular feature it was added and it is there to stay. Basically it works the same way that export to excel or word works. It's able to create new table if it doesn't exists in database, alter table if for example new fields in data will show up, and finally it can work via mapping of columns. + " Following table contains forest summary with important information:"
It works for any data type so feel free to experiment. You can also use it with Table Mapping defined just in case you don't want to allow anything go unnoticed. Exchange, Exchange Online, Azure AD? 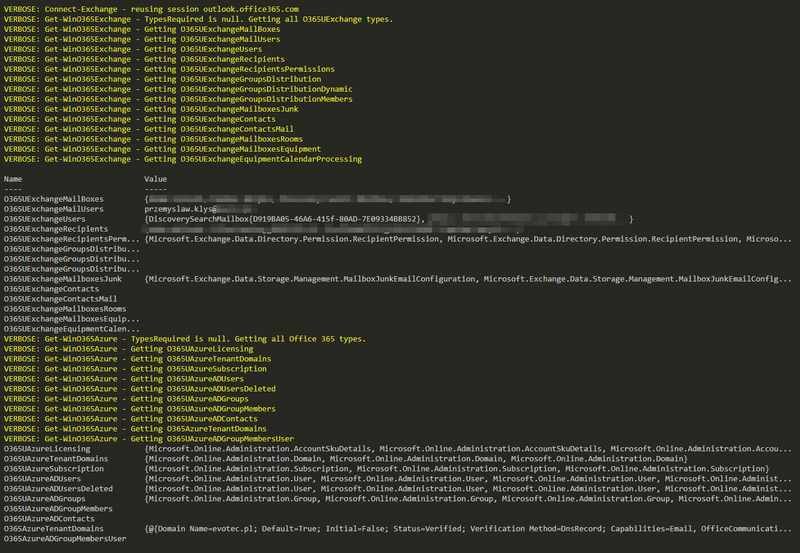 Just so we're clear here… it's very basic and it's very start of Exchange, Office 365 data sets. I made it so that you could throw in ideas on what proper documentation for each service should contain. I do plan to add Teams, Skype and other Office 365 services support. I've not made extensive testing on connecting, reusing connections or working with MFA (I expect it to not work actually at the moment). This is all planned and will be fixed within next few weeks. There is one more thing here that is planned and didn't make it for 0.2 version – support for Export-CliXML. Generally when working with large services like Office 365, Exchange, AD that sometimes throttle you when you try to get all data it's not really efficient to work on LIVE data all the time. So the plan for next release is to allow script run once, export data to XML and on subsequent retries when you will be reworking the way your documentation looks like it will not ask Office 365 again, and you won't have to wait 3 hours to get data you need. But for now… you can either use it as is or skip this part until next version. There is one more thing to know here. Each data sets starts with O365 or Exchange. Then if there's U for example ExchangeUServers it basically means it returns all data provided by command and usually has not been processed by me to prepare it for Word output. However if there's no U in name it means output was processed and kind of provides some specific data and is more or less Word friendly. As you see above ExchangeServers has stricly defined data. You can also treat this as a guide on how easy it's to add new data to data types already defined. You prepare something like above and add it to Get-WinExchangeInformation.ps1, add name of it to Enums\Exchange.ps1 and that's it. After restarting PowerShell session it's basically available as part of data set. Therefore if you have skills feel free to either make PR on GitHub or if you don't want to play with PR's just open an issue and paste your code there. If it will be working and more or less good enough for this I'll add it. This output can be generated with following code. You can work with that HashTable / OrderedDictionary object in any way you want. But like I said earlier it's just a starting point and something that will have to grow in next few weeks. Text            = "This is test"
Prescanning of headers - What is it? You get all (or most of it) Active Directory holds for users. The trick is each object within $AllUsers can have different fields and it will only return those which are set. This means that first object can have 50 properties, 2nd object 100 and 3rd object 90. Not at all the same properties in all cases. While in normal case it doesn't really matter when you export to Excel or export to SQL you need to know before hand all properties to create table or to make sure they are always returned in same order. The prescanning feature does just that. It scans $AllUsers for all properties returned by each and every object and adds them up creating one big list. In old version without prescanning this module would take only 1st object, extract it's properties and based on that build Headers, Tables. This would mean if first object didn't contain ExtensionAttribute1 to 15 you wouldn't get them on subsequent objects. Prescanning solves this. The order of columns may be a bit off but it's well worth it.